Low blood sugar and how it can become a really bad habit. When you’re a nine-year-old kid, the word “diabetes” is not generally a familiar one—or at least it wasn’t to me. To me, it meant a world of change in the blink of an eye. It meant going from being a “regular kid” to one with a chronic disease that would require constant, around-the-clock monitoring of food intake, injections, and blood sugar checks. It meant not being a “regular” kid anymore. These feelings are true of anyone who is diagnosed with diabetes, no matter what age it happens. One of the things that tend to happen as a person with diabetes develops their protocols on daily management is a specific thing we eat or drink when our blood sugar gets low. Now, for some people, this has always been juice and there is nothing else to it. However, for me and for many of the people with diabetes I’ve worked with, having a low blood sugar was an excuse to have some kind of treat. And not just a little bit of a treat; it was usually a huge portion of that treat, plus some other things as well. For me, it ranged anywhere from Skittles to a big bowl of Cocoa Pebbles with milk (if I only knew then what I know now! ), to a big bagel with melted cheese, and anything else unhealthy you could think of. And it would not be the serving size required to treat my low blood sugar! It was always at least double or triple the amount that would have been needed, and that, my friends, packed on the pounds! So after many years of “treating” myself when my blood sugar was low, I finally realized what a detriment to my health it had become. I also noticed how often my blood sugar levels were fluctuating from low to very high afterward, the blood sugar rollercoaster. With the giant portions of carbs I was eating to treat the low blood sugar, I was always over-treating, which would lead to high blood sugar an hour later. This then required more insulin, and more insulin allows more fat storage on the body, and you can see the vicious cycle that I had going on. 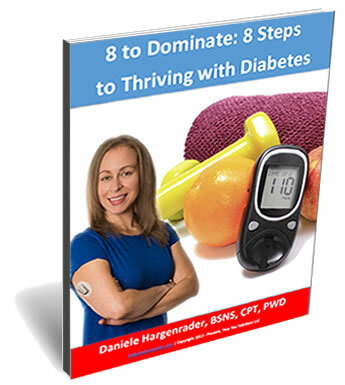 With a hemoglobin A1c of 13.5% at its highest, and being considered obese on the height/weight measurement scale at 200 pounds, eventually I realized I was going about taking care of my diabetes the wrong way. The human brain is an amazing thing, and when we train it to know that a treat is coming when our blood sugar is low, we are subconsciously training ourselves to have more low blood sugars than we would if we were just using 100% juice boxes, glucose gel, or glucose tabs and never anything else. Low blood sugar is horrible for our brains and every other part of our internal environment. Go stock up on 100% juice boxes, glucose tabs, and glucose gel. Learn from my mistakes, friends: don’t “treat” low blood sugars with junk food. Bad habits are tough to break! How do you choose to treat your lows? Have you ever noticed having the same challenges I used to? Leave a comment and let me know!